Simone Biles once again put her name in the history books, earning her third consecutive national title, with a two-day combined score of 124.1 and a out of this world 63 all-around score on the second day. The race for second and third was tight and changed throughout the night, but Maggie Nichols who shone from start to finish, managed to claim the silver with a 119.15. Aly Raisman grabbed the bronze with a 118.55. Key followed closely for fourth with a 118.35 and Douglas rounded out the top group with a 117.95. Biles began the nights with a 61.1 all-around, a 1.4 lead over Nichols. 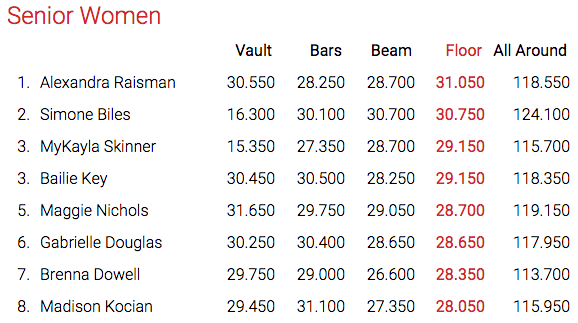 Douglas, Raisman and Key all followed closely at just over a point to 1.2 behind. There was a full house at the Bankers Life Fieldhouse and the crowd was electric. The one at a time format made sure each gymnast got their due. Rotation One began with Nichols on bars. She started her evening out with a bang, showing off her light, flowing bar routine with a stick to boot for a 14.8. 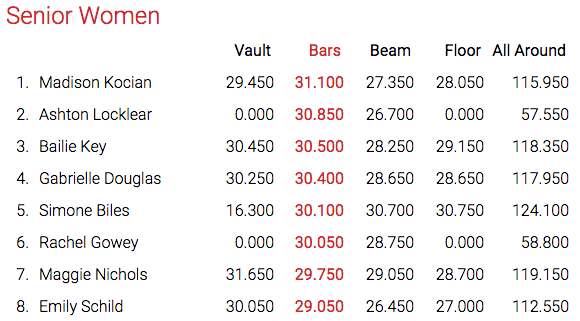 Ross was up next on vault, delivering a double twisting yurchenko, but landed with her chest quite low for a 14.55. Douglas followed suit on bars, delivering a strong routine on her best event with just a small hop on landing. Biles started the night out on beam. This event has been a trial for her this week, but she overcame her earlier jitters with one of her best beam routines ever, including a stick on her dismount scoring an out of this world 15.9. Raisman also got started on her best event, rocking the entire arena with her sky high tumbling, and hitting two solid floor routines in a row (minus a blip on her split half to end) for a 15.5. Key finished up the top group on beam as well. Redeeming her fall yesterday, she hit a great routine for a 14.55. At the end of the rotation Raisman had moved up a spot to third, overtaking Olympic teammate Douglas. Rotation two kicks off with four big hitters in a row. Starting with Raisman on vault. She threw her amanar and landed with a locked knee but seemed to be ok, scoring a 15.35. After a great warm-up, Kyla fell on her dismount once again on bars, earning a 14.05. Douglas had a good beam routine with a few wobbles to earn a 14.2. Biles completely redeemed herself on floor, sticking her last pass for good measure for a whopping15.85. Ashton Locklear nailed her bar routine, scoring a 15.45. Key took the floor with her tuxedo ringmaster leo to perform an enchanting routine that earned a 14.7. Nichols was last up on beam, where she competed a solid beam routine earning a 14.65. 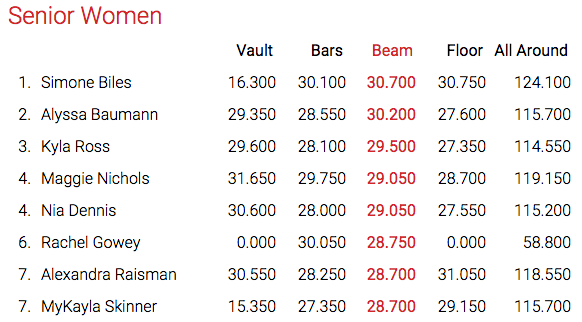 At the end of rotation, Raisman had gone into second, overtaking Nichols by .35. Key led off rotation three on vault with a double twisting yurchenko. She has a fairly large hop on the landing but is beautiful in the air for a 15.2. Skinner hits her packed floor routing two nights in a row, earning a 14.8. Next up are Gowey and Kocian on bars, both trying to show their contributions to the team as bars specialists. Gowey scored a 14.7 and Kocian scored a 15.6 for her gorgeous bar routine. Nichols danced her way through her high tumbling floor routine for a 14.15. Biles followed her on vault, rocking her amanar for a sky high e-score of 9.9 and a 16.3. Raisman was up on bars, where she did one of her cleaner bar routines for a 14.1. Ross looked to redeem herself on beam, showing a solid routine with a stuck dismount scoring a 15.25. Douglas finished out the rotation rocking her floor routine and improved by almost point from night one for a 14.8. At the end of the rotation Biles was in the lead followed by Raisman, Nichols, Key and then Douglas, all separated by eight tenths. The last rotation was a battle for the podium, led out by Nichols on vault. Nichols hit a great amanar for a 15.85. Douglas vaulted a clean double twisting yurchenko with a small hop for a 15.15. Biles finished out one of her most dominant nights of competition on bars, where she earned a 14.95, totaling a 63 all-around for the night. Raisman followed on beam, needing the beam routine of her life to hold on to second. She was solid, scoring a 14.95, but it was not enough to hold on to second. Ross hit her tumbling passes on her floor routine, but missed a lot of her leaps and looked tired at the end, earning a 13.8. Key ended on bars, with a beautiful routine, just one overbalanced handstand to score a 15.3, pulling up into fourth. Alyssa Baumann finished out an incredible night of competition with her beautiful beam routine for a 15.05. Biles won her second national championship on vault, with Skinner for the silver. 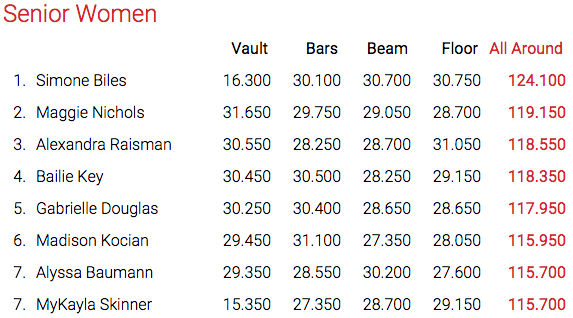 Kocian took the bars title followed by Locklear, then Key. Biles won another title on beam, with Baumann taking the silver and Ross the Bronze. Raisman won another floor national title followed by Biles for silver with Key and Skinner tying for bronze. At the end of the night, Aimee Bowman was named coach of the year, Biles was named athlete of the year and Raisman was named sportsman of the year. The national team named on this night were the top six in the all-around Simone Biles, Maggie Nichols, Aly Raisman, Bailie Key, Gabby Douglas and Madison Kocian. Also added to the team were Nia Dennis, MyKayla Skinner, Alyssa Baumann and Kyla Ross.